After having my dogs’ blood taken for their heartworm screen, I was on pins and needles once again as I awaited the results. Getting the call that says our dogs are heartworm- and tickborne disease–free is always such a relief—especially because we don’t use our vet clinic’s recommended preventative medication. 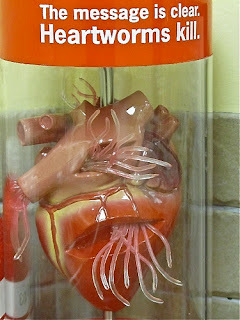 are owners told heartworm is treatable. Last year, a colleague who had given her two beautiful English bulldogs their Revolution doses faithfully every month the previous summer learned that one of her dogs had contracted heartworm regardless of the preventative medication. The cure? Much larger doses of the same active ingredient that’s in the prevention and six weeks’ crate rest except for very brief leashed excursions outside just to attend to “business.” Her experience of the prevention not working has made me feel even better about my decision not to use it. Nevertheless, I admit, I will be on pins and needles once again next year as I await the results of my dogs’ heartworm tests. Until then, we’ll keep on doing what’s worked so far: focusing on good nutrition and using homeopathic options. Have any of you had experiences—good or bad—with heartworm preventatives or homeopathic options? If so, please share in the comments! Thinly slice lemon and place the slices in a large bowl. Pour boiling water over lemons. Add branch of fresh rosemary and tea tree oil. Let sit for 24 hours. Strain into a spray bottle. Avoid spraying in eyes or on mucous membranes. Note: I keep the bulk of this solution in the fridge and only small amounts in a spray bottle because it has grown mould when not refrigerated. Very good post. Great recipe for homemade bug spray too. You bring up a very good point – that vets tell you a preventative is the best way to protect from heartworm, but they don’t tell you it is not really preventative. It is essentially the same as the treatment. Using a toxin to kill the larvae in the bloodstream once a month does not actually prevent your dog or cat from contracting heartworm in the first place, it just kills it once they get it. Essentially, it is equivalent to taking a dose of chemotherapy once a month as a cancer prevention treatment.